Many low-income Iowa families, that might not be able to afford a summertime staple in the state, will get the chance this year. 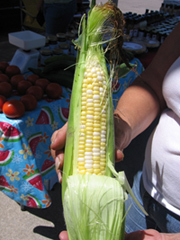 Cory Berkenes, executive director of the Iowa Food Bank Association, says his agency is partnering with a sweet corn grower to provide thousands of free ears of the vegetable to hungry Iowans. “This first opportunity, we’ll have about 500 dozen ears of corn, so about an acre of corn for this first time,” Berkenes says. The sweet corn seed, donated by Monsanto, was planted by Jacob and Emily Van Manen, owners of J & E’s Delicious Sweet Corn of Kellogg. If the weather cooperates, the sweet corn will be harvested in July and donated to the Food Bank of Iowa for distribution. “A lot of families, you know, just can’t afford the fresh produce,” Berkenes says. “So, having this chance to bring this into their homes…is an added bonus.” Once harvested, Berkenes says the sweet corn will travel from the farm to the table in less than one week. He’s hoping the effort might be expanded next year. “This is just the first project like this we’ve done and we’re hoping it maybe can grow into something more in future years. We’re really excited about it,” Berkenes says.